Tennessee Attorney General Herbert Slatery joined nine other attorney generals and a governor today in sending a letter to President Donald Trump's administration calling for the end of a program that protects young immigrants from being deported, as well as allows them to work. The 11 signatories of the letter are demanding that the five-year-old Deferred Action for Childhood Arrivals (DACA) program be formally rescinded before September 5 of this year or they will challenge the program in court. In Tennessee, ending DACA would mean the loss of over 8,000 jobs for young immigrants, putting businesses across the state in the position of having to hire and train new employees. Additionally, according to public policy research organization, the Cato Institute, repealing DACA would result in a $60 billion loss in federal revenue, with a $280 billion reduction in economic growth over the next 10 years. 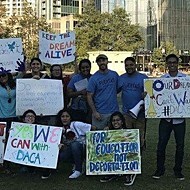 Youth Organizer with the Tennessee Immigrant and Refugee Rights Coalition and DACA recipient Cesar Bautista, says the group will continue to defend the program. "It is shameful that Attorney General Slatery would join forces with other extremists attorney generals to launch an attack on DACA recipients like me," Bautista said. "Tennessee is our home, and we will not let our attorney general help deport us. We are here to stay."